“Hidden Mickey 3: The Mermaid’s Tale” is now available! Writing a book is an exciting process. There are ideas, situations, funny stories, and characters that have come to be as familiar as family that we writers want to share with our readers. Many months, sometimes years, can go by before the story is ready and in print. It can seem an extremely long time for the author as well as the readers who are anxious to see how their favorite character is doing. You well know that most of my stories end with something of a cliff-hanger. I do wrap up the main story line, but I always leave something dangling that will lead into the next book. I, too, worry about my characters and want to see how the problem or danger will work out! In my last novel, Hidden Mickey Adventures 2: Peter and the Missing Mansion, Peter and Catie were being shadowed by a mysterious woman who seemed to be following their every move. The book ended with Peter being in possession of something that the woman wanted – very badly! And, she made it very clear to Peter that she would do whatever she had to to retrieve it. I am happy to announce that the wait is over! 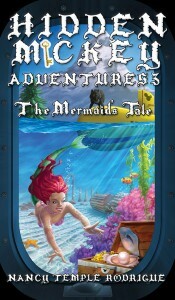 Hidden Mickey 3: The Mermaid’s Tale was officially released July 1st, and now available. You will find out the identity of this mysterious woman named Omah and why she is so intent on getting the item back – even though it makes no sense to anyone around her. Our favorite security guard Wolf is on hand trying to protect the children. However, Omah seems to stay one step ahead of him at every turn. 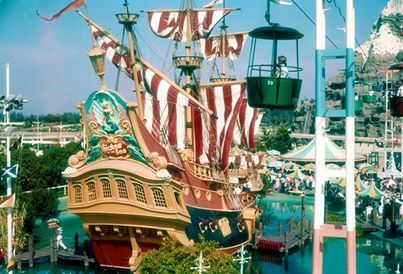 Readers will relive the Disneyland of the 1960’s as they get to ride along on the original Submarine Voyage and the Motor Boat Cruise. Stand with Walt Disney himself on the deck of the Chicken of the Sea Pirate ship that stood so elegantly in Fantasyland. Travel with Walt and Lillian to Ireland where he makes a very special purchase.